Thanks to everyone who helped out with Software Freedom Day this year around the world, and thanks to all those that attended one of these events. Here in Auckland we had a great weekend with Albany on Friday followed by the Mt Eden event on Saturday at Orion Cafe. There were about twenty or so people at Albany Senior High on Friday. 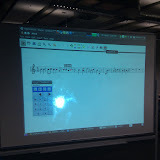 There was gaming (shoot ’em up styles), a demo by Mark of Open Shot (video editing software) and Nted (create sheet music), fun with magnets (thanks Dave), one laptop per child playing and Sugar giveaways, Ubuntu CD giveaways and demo of running live CD on a Mac, and lots of chatting. It was great to see some teachers there from another school. Looking at my photos and trying to recall who I spoke to, I think there were around seventy or so people at Orion Cafe on Saturday. Conversations ranged from Asterisk phones, to electric cars, to one laptop per child, to what is freedom, and more. There were people cutting out penguins and gluing them together, people playing Physics in Sugar on the XO laptops, and people chatting and drinking coffee. Fabiana was working on an open source project with two of the attendees at one point, and I am sure new recruits were found for LUG and olpc. It was unfortunate that one of the attractions, the reprap 3d printer, could not make it. We haven’t yet heard what the problem was there, but there is speculation that it relates to the horrific weather the night before and the fact that Vik (owner of the printer) is a volunteer with the fire brigade. The ebb and flow effect of people arriving and leaving throughout the day meant there were two “proper talks” and the rest of the day was very informal. The first talk was UALUG on Linux 101 and the second was Peter and Dave leading a talk on what is freedom. A big thanks to Orion for sponsoring the event and opening the cafe on a Saturday, and thanks to Chris for feeding us, filling us with coffee (love the chocolate you use and the biscotti on the side was tasty) and smiling all day long while you ran the place on your own. We really appreciated the great environment and plan on asking if we can come back again next year. In case anyone is wondering, you can book Orion Cafe for evening functions and it makes a great venue for birthday parties. It seems the electric car was a hit with all the attendees this year, with Tom giving multiple talks about how it works and talking about the open source battery management system. Phil was also at Software freedom day with his test kit showing people the open source electric motor controller (for those of you who missed it, Phil owns the Greenstage electric saker; Tom owns the Carrott Electric mini; Tom, Phil and others work on something called the Tumanako project which is building open source electric car hardware and software). Hopefully the success of the two events are early signs of big things to come for free software in schools and in our communities and that we will see this event grow each year in Auckland and around the world. Once again, a big thanks to all those involved in Software Freedom Day here in Auckland, and all those who celebrated the day around the world. I look forward to celebrating again next year with all of you and all the new people you bring along with you next year. 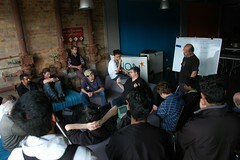 The first Auckland event for Software Freedom Day 2010 was held at Albany Senior High School this afternoon. Attendees were a mix of students from the school, some teachers from another school who were in the area, interested people, and some open source enthusiasts. There was gaming, demonstrations of software and fun with magnets, the olpc laptops, and general conversations. 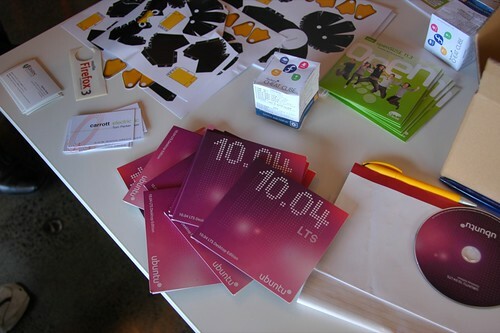 Ubuntu CDs were handed out and a few Sugar on a Stick USBs. This week I am taking part in a global celebration called Software Freedom Day. The official date is 18 September, however why not celebrate it for a few extra days. For my contribution to the celebration I am part of the team organising the Auckland celebrations. This Friday 17 September there will be an event at Albany Senior High School from 4pm – 6pm. 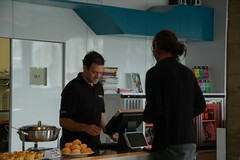 This Saturday there will be an event at Orion Cafe in Mt Eden from 10am – 4pm. Both events will involve having lots of fun, talking to people and trying new things. olpc will be there with the little green laptops. There will be games, guest speakers and giveaways. If you want to read more about the events visit http://softwarefreedomday.org.nz/ and I really hope to see lots of people there to celebrate with us.